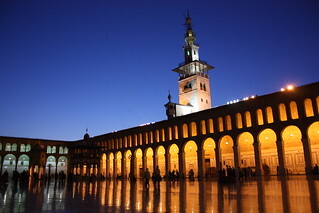 The Umayyad Mosque, also known as the Great Mosque of Damascus (Arabic: جامع بني أمية الكبير‎), located in the old city of Damascus, is one of the largest and oldest mosques in the world. It is considered by some Muslims to be the fourth-holiest place in Islam. After the Arab conquest of Damascus in 634, the mosque was built on the site of a Christian basilica dedicated to John the Baptist (Yahya), honored as a prophet by Christians and Muslims alike. A legend dating to the 6th century holds that the building contains the head of John the Baptist. The mosque is also believed by Muslims to be the place where Jesus (Isa) will return at the End of Days. The tomb of Saladin stands in a small garden adjoining the north wall of the mosque. The ground plan of the Umayyad Mosque is rectangle in shape and measures 97 meters by 156 meters. A large courtyard occupies the northern part of the mosque complex, while the haram ("sanctuary") covers the southern part. The courtyard is enclosed by four exterior walls. Three arcades make up the interior space of the sanctuary. They are parallel to the direction of prayer which is towards Mecca in modern-day Saudi Arabia. The arcades are supported by two rows of stone Corinthian columns. Each of the arcades contain two levels. The first level consists of large semi-circular arches, while the second level is made up of double arches. This pattern is the same repeated by the arcades of the courtyard. The entire sanctuary measures 136 meters by 37 meters and takes up the southern half of the mosque complex. Within the Umayyad Mosque complex are three minarets. The Minaret of the Bride (Madhanat al-Arus) was the first one built and is located on the mosque's northern wall. The exact year of the minaret's original construction is unknown. The bottom part of the minaret most likely dates back to the Abbasid era in the 9th century. While it is possible that the Umayyads built it, there is no indication that a minaret on the northern wall was a part of Caliph al-Walid's initial concept. The upper segment was constructed in 1174. This minaret is used by the muezzin for the call to prayer (adhan) and there is a spiral staircase of 160 stone steps that lead to the muezzin's calling position. The Minaret of the Bride is divided into two sections; the main tower and the spire which are separated by a lead roof. The oldest part of the minaret, or the main tower, is square in shape, has four galleries, and consists of two different forms of masonry; the base consists of large blocks, while the upper section is built of dressed stone. There are two light openings near the top of the main tower, before the roof, with horseshoe arches and cubical capitals enclosed in a single arch. A smaller arched corbel is located below these openings. According to local legend, the minaret is named after the daughter of the merchant who provided the lead for the minaret's roof who was married to Syria's ruler at the time.